What accessories for what practices?? Your firsts pictures with Light Painting! Build your own light bars! You are yourselfer? An artist of scotch roll? A soldering iron does not make you afraid? So take the opportunity to make your own tools LightPainting! Making your own tools is not so complicated, you'll see. You only need not to be afraid to get started, take time and start when it please you. Above all, be creative! Feel free to send us photos of your creations! Or propose us to share your most daring ideas! 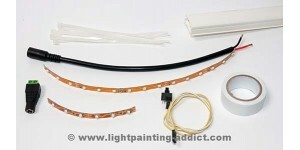 The LED strips are increasingly used nowadays for decorative lighting for example. So why not use them to make your own Light Painting tools ?? Established in 2010, www.LightPainting-Addict.com is the first site 100% dedicated to the practice of Light Painting! Suitable material, tutorials, tips, you will find everything that can be useful to get you started or improve your practice of light painting. Do not hesitate to ask us your questions by email, we will respond promptly.